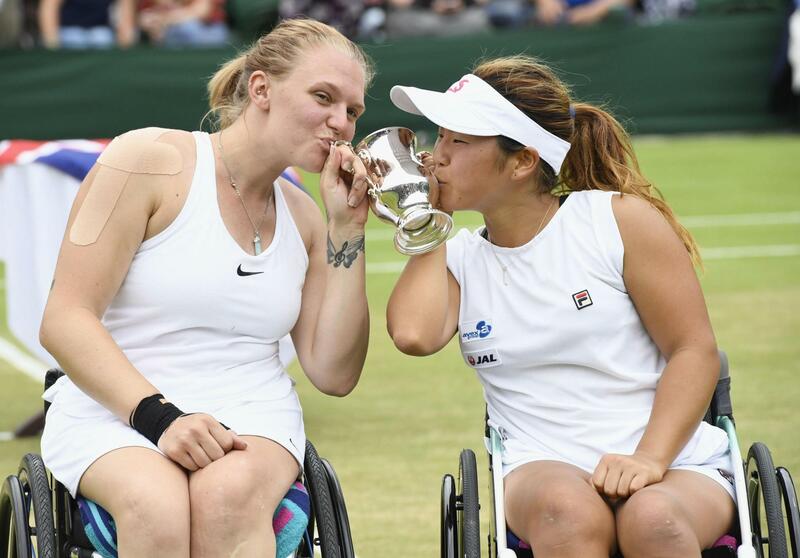 LONDON - Yui Kamiji and Jordanne Whiley of Britain clinched their fourth consecutive women’s wheelchair doubles title at the Wimbledon on Sunday. Kamiji, 23, and Whiley, 25, came from behind to defeat Dutch pair Marjolein Buis and Diede De Groot 2-6, 6-3, 6-0 in the final, sealing the victory by taking nine consecutive games. 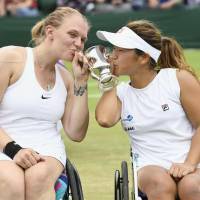 “I’m glad we won because I teamed up (with Whiley) for the first time in a year so I thought it would be difficult for us to win the title this time,” said Kamiji, the bronze medalist in women’s singles at last year’s Rio de Janeiro Paralympics. She lost in the semifinals of the singles competition at Wimbledon on Friday. “Because we’ve worked together for so long, we were able to talk to each other on the spot throughout and get ourselves back into the game,” she said of her teamwork with Whiley. The duo had not played together since last year’s Wimbledon as Whiley was out with injury for about eight months. “There is nothing more satisfying than winning with her,” Kamiji said of her partner.